Farmer Paul Roderick walks among the beasts on his Harrisville farm. Photo Mark Cranitch. LAST night Coles and Aldi announced they would lift the price of their own brand milk "breaking the back" of $1-per-litre milk. It follows intense pressure, which only increased last month when Woolworths announced it would no longer sell $1-a-litre milk. Kingaroy dairy farmer Damien Tessmann started the C'mon Coles social media campaign when the retail giant refused to follow in Woolworths' footsteps. He released a video that went viral, urging consumers to boycott Coles until they ended $1-a-litre milk. Mr Tessmann was surprised but elated to hear the announcement. "I think it's a great victory for the farmers and for people power," he said. "It's been a multi-pronged attack. "A lot of work has been done by farm advocacy groups, and a part has been played by fair-dinkum politicians. "But the biggest thing has been consumers. "They do want to help the farmers out. "From the start it was pretty clear from all their statements that Coles didn't want to change, so the fact that they did is a huge win." Mr Tessmann said he liked to believe his online campaign had an impact on Coles' decision. "The original video had a huge amount of views. And that sits in the back of their minds," he said. "And I think if people had a choice between Coles and Woolworths, they chose Woolworths. I'd like to think it had an effect. "Consumers did the heavy lifting. You won't catch me criticising city people because I think they helped us out considerably." The 10c per litre price difference won't be life-changing for farmers, but Mr Tessmann said it was a step in the right direction. "It's an extra 10c on the own brand milk sold in Coles and Woolworths. It's not an extra 10c that's sold on all the branded milk," he said. "But we've broken the back of it, and I think that's important. "In terms of the farmers, it's probably going to be 3-5c extra on the load of milk. "But it's that farm-gate confidence - that's the biggest thing. "When farmers sit back and think 'why am I doing this?' when they're being pushed around by Coles and Woolworths, they know they can make a difference." Mr Tessmann said the end goal was to gain a fair price and have the market operate normally. "$1-a-litre milk manipulated a market until it couldn't operate how it's supposed to. It was nailed at that price and couldn't move," he said. "Clearly it ($1-a-litre milk) was a marketing campaign. "But that's been broken. Now hopefully it can go up and down with the industry." 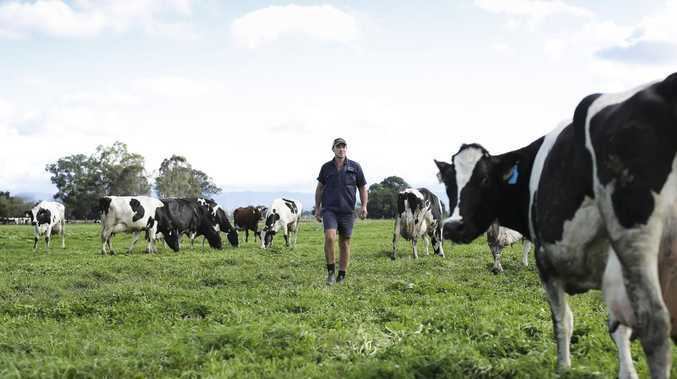 Mr Tessmann said he hoped more change would come with the Dairy Code of Conduct, but he didn't have high hopes for the implementation of a floor price, which was put forward by Shadow Minister for Agriculture, Joel Fitzgibbon. "The ACCC has been the budgerigar in all of this. They sat by and let everything that happened in the industry happen without lifting a finger," Mr Tessmann said. "I think the ACCC needs to cop a bit of flack in this. I don't know what their role is if they can't even help the dairy industry. "With Joel Fitzgibbon putting this floor price into the ACCC, I don't think it will do anything. "If they can't even fix $1-a-litre milk, I don't see how they can implement a floor price." Coles said in a statement that "in support of Australia's dairy farmers" it would increase the price of 2-litre and 3-litre Coles brand milk by 10c a litre from March 20. Coles said while it was currently paying dairy processors "the highest farm-gate milk prices in four years, without passing on the added expense to customers" it was clear "that many dairy farmers, particularly in northern Victoria, NSW and Queensland, are struggling as a result of drought". In a statement, Aldi said it would increase the price of its 2-litre and 3-litre Farmdale fresh milk by 20c and 30c respectively as of March 20, with the additional proceeds being passed on to dairy farmers in full. "This represents a short-term solution to an industry-wide problem that requires co-ordinated Federal Government-led structural reform," Aldi said. Federal Agriculture Minister David Littleproud said "Coles and Aldi's announcement that they'll no longer sell milk for $1 means we're breaking the back of the $1 milk model". "It's time farmers received fair reward for their effort," Mr Littleproud said in a statement. "These people produce our food."